The Namaqua Quest 3 Day Trail Running Stage Race, organized by TriSport SA in partnership with WildTrail SA, takes place every year during Namaqualand’s colourful flower season. This year, however, due to the crippling drought, not many flowers were visible but that did not deter athletes from enjoying one of the highlights on this year’s trail-running calendar. 130 runners, the most in the history of this event, gathered at the Jakkalswater Guest Farm located about 17 km from Springbok, on the afternoon of Wednesday, 23 August for registration and the race briefing. Many old trail-running friends were reunited and new friendships formed, and runners went to bed filled with excitement for the first stage of this 3-day event. Day one kicked off at 07:00 at Toringberg. Lining up the runners and organizers experienced the typical chilly weather that the area is known for but this changed quickly as the sun crept higher and higher into Namaqualand’s clear blue sky. Stage one covered a distance of 24 km with a bit of a climb around the 6 km mark. Stage 2, which is the longest covering a distance of 29 km, took runners through the famous Goegap Nature Reserve. This 7 000 hectare reserve, supports 600 different indigenous plant species, 45 mammal species and 94 bird species. The characteristic granite domes and peaks of the region contrast with the sandy plains, where springbuck, gemsbok and Hantam’s Zebra forage. The final stage, with a distance of 16 km started at the race village for the event – the Jakkalswater Guest Farm. As with any great trail, runners were treated to a little bit of everything, from tough climbs, fast downhills, sandy parts as well as a couple of technical sections – but all of these faded compared to the spectacular scenery of the area. After 3 stages, and a total distance of 69 km, it was the men of the Veteran category that took the top positions. In overall first place was Christo Muller with a time of 06:25:04. In a very close second position was Nick Galpine with an overall time of 06:26:09. Greg Torr finished third overall with a time of 06:50:34. First female overall was Alexandra Marko with her time of 07:34:31. Second female overall (and first in her category) was Masters athlete Marie Ayton, sporting a time of 07:44:40, followed in third overall position by Lize Cornelius (07:56:53). Massage therapists were at the event and runners who booked beforehand were able to enjoy treatment -­ this helped to increase recovery between the different stages. Event organizers TriSport SA and WildTrail SA would like to thank their sponsors First Ascent, SPAR, Time Freight Express, Namaqua Wines, Springbok Nashua and Springbok Toyota for their support during this event. TriSport’s next event will be the Namaqua Quest MTB 3 Day Stage Race that will take place from 31 August-2 September. Visit trisport.co.za for more information about this event. 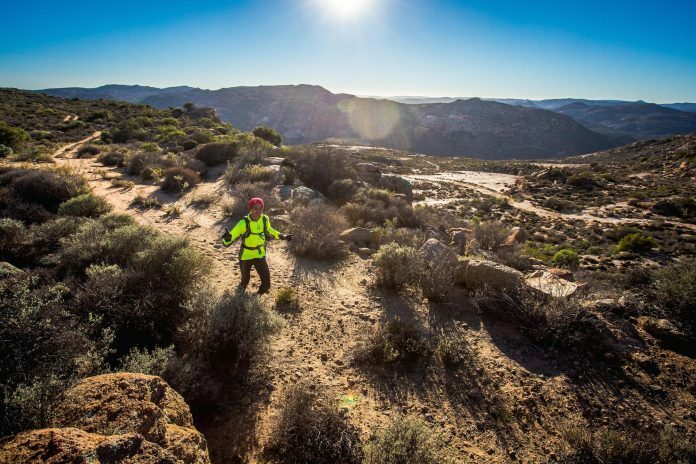 The 2018 Namaqua Quest Trail Running Stage Race is scheduled to take place from 23-25 August. Follow the event’s Facebook page or visit their website to see when entries for next year’s event will open.